The site is currently occupied by a terrace of two-storey commercial properties. 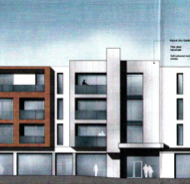 Kamus Developments Ltd and Gregory Architects submitted a planning application (Z/2011/0988/F) in August 2011 proposing to develop a four storey building comprising three ground floor commercial units and 14 no. apartments above. The application was approved in October 2012. The site was placed on the market by Savills in January 2014 with offers invited over £75,000. The site sold in December 2014 for an undisclosed sum. Castlereagh Developments 1 Ltd and Gregory Architects submitted a planning application (LA04/2017/2102/F) in August 2017 proposing to develop a four storey building comprising 3no. ground flood retail units and 14no. apartments above.